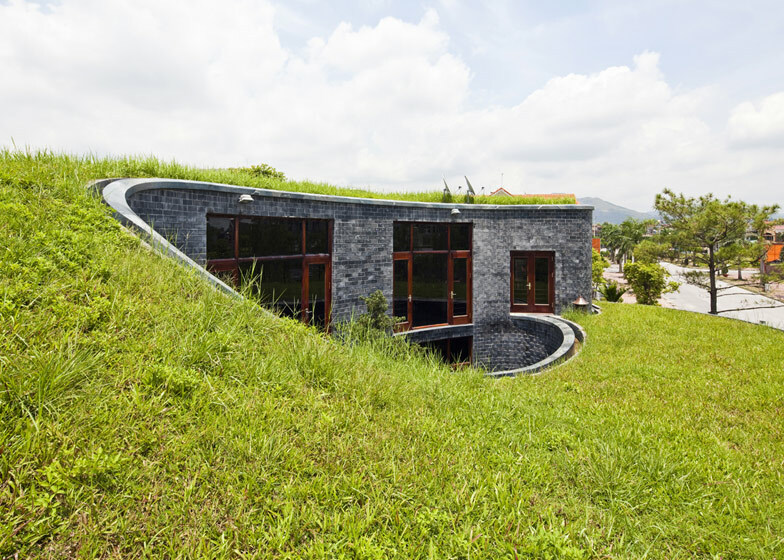 This spiralling stone house in Vietnam by architect Vo Trong Nghia has grass on its roof and an oval courtyard at its centre (+ slideshow). Vo Trong Nghia wanted to avoid copying the concrete and plaster buildings that are common in the surrounding Quang Ninh province and to instead create "a space that can record the changes and traces of time over the years through the aging of natural materials". Following this concept, the two-storey Stone House is constructed from locally quarried stone blocks that are stacked up in an alternating grid to give a brickwork pattern to the walls. Dark timber frames surround the windows and stand out against the muted grey colour of the stone. 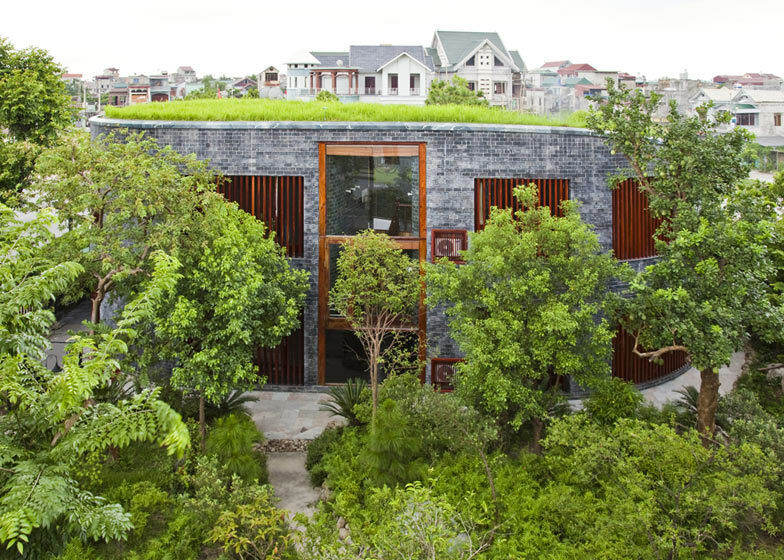 Like many of Vo Trong Nghia's projects, the house was designed to minimise energy consumption. The central courtyard contains both a tree and a pool of water, intended to naturally cool the surrounding rooms. Similarly, a thick layer of grass blankets the entire roof and is maintained by an inbuilt irrigation system. The spiralling volume of the house gives a variety of ceiling heights to rooms on both floors. Bedrooms are stacked up on top of one another with lower ceilings, while the living room becomes a double height space. Small study areas branch off from the main corridor and slot into the spaces between rooms. 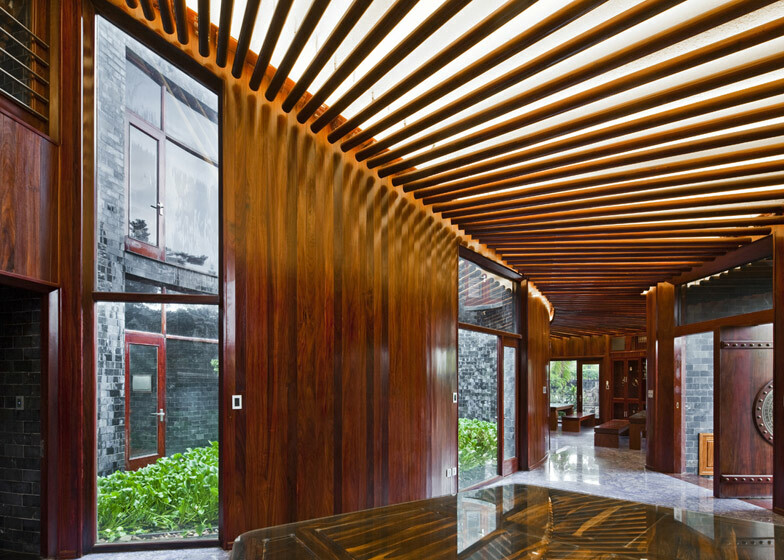 Dark wood beams create stripes across the ceilings and accommodate low-energy LED lighting. Timber also lines the walls in most rooms and was used to construct the staircase. 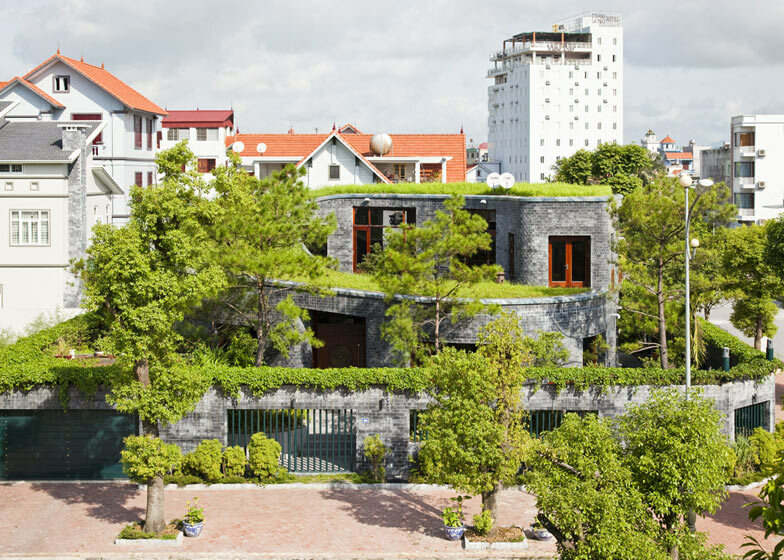 Vietnamese architect Vo Trong Nghia has studios in both Hanoi and Ho Chi Minh City, and his firm picked up two awards at the 2012 World Architecture Festival for the Stacking Green house and Binh Duong School. Speaking to Dezeen, Nghia explained his plans to reduce the energy crisis in both residential and public buildings. 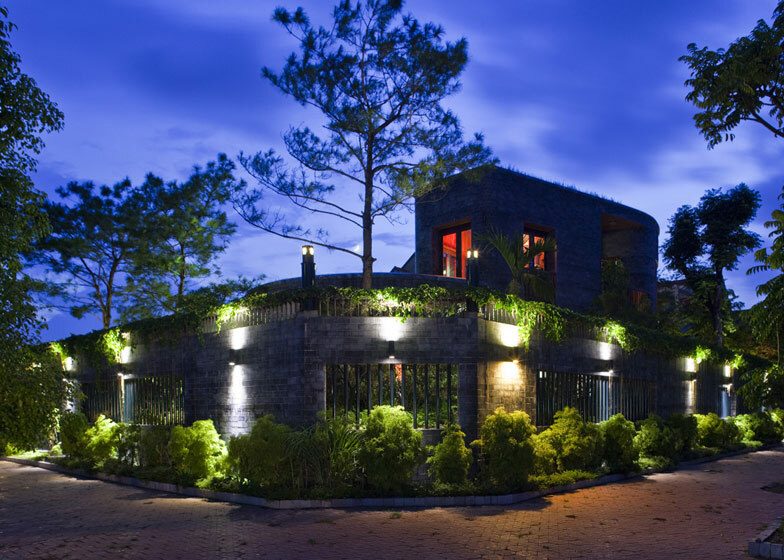 This torus-shaped stone house is located in a quiet residential quarter beside the way to Ha Long Bay from Hanoi. A rising green roof and walls composed of subdued color stones in dark blue create a landscape, which stands out in the new residential area. In Vietnam, ordinary houses are made by reinforced concrete, brick, plaster and painted boards despite there are abundant natural resources in the country such as stone, timber and so on. The subject of this project was to create a space that can record the changes and traces of time over the years through the aging of natural materials, which contributes to cultivate the beauty and enhance inhabitants' affection for the house. 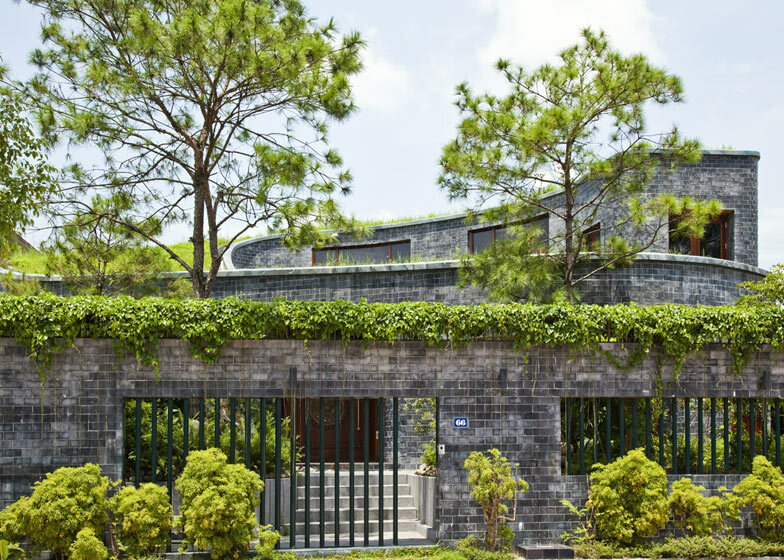 To achieve this goal, stones quarried from Thanh Hoa province (so-called blue stone) and hard wood ("Go Huong") were chosen for the main material of the house and they are designed together with greenery. 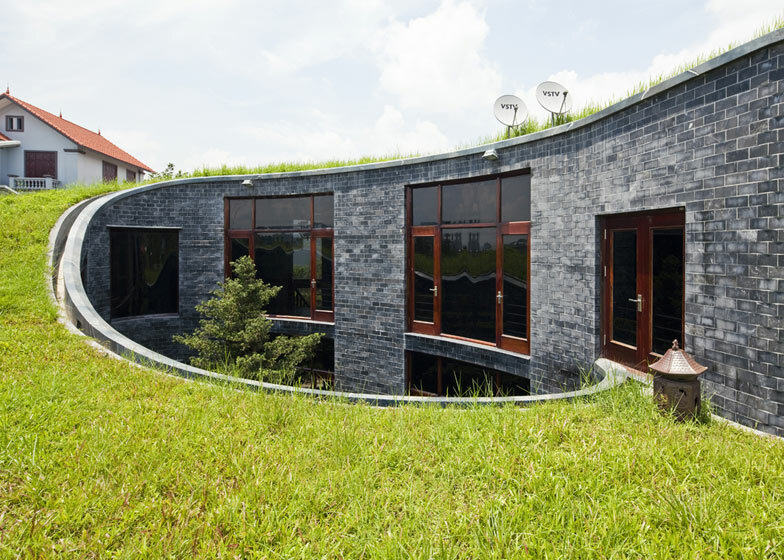 A characteristic of this house is the layout of rooms in an elliptic plan. The rooms, composed of four clusters, surround the oval courtyard, making a colony-like relationship. The voids are inserted between each room-clusters and become activity nodes for its inhabitants as well as pathways for wind and light, connecting the courtyard and outside garden. The surface of the oval courtyard is a shallow pond with a symbol tree, which let cool air flow into the interior spaces. Circulating flow runs around the courtyard and continues to the green roof, connecting all places in the house. 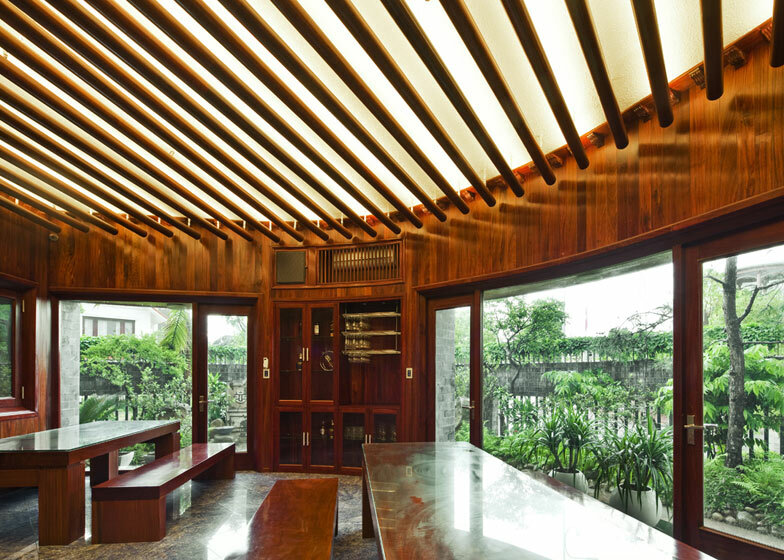 The rising roof creates spaces with various ceiling height, which correspond to the functions of the house. For instance, the living room has nearly five-meter-high slanted ceiling, which provides verticality and openness. The courtyard and the green roof compose a sequential garden, which creates a rich relationship between inside and outside of the house. Residents discover the changes of the seasons and realize their wealthy life with the nature, thanks to this sequential garden. Irrigation pipes are buried under the soil of green roof as a component of automatic watering system, to lighten the maintenance work of the inhabitants. To create a wall with smooth curvature, cubic stones with 10cm thickness, 10cm height and 20 cm width are carefully stacked. 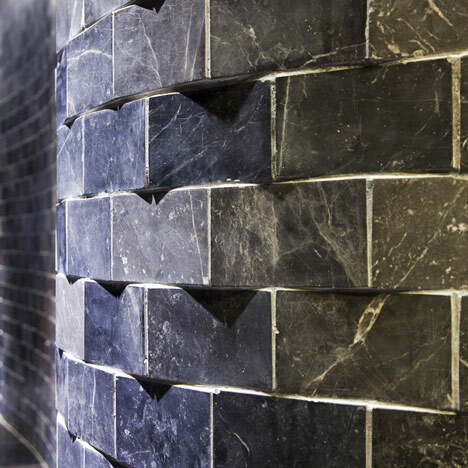 The curved wall was stacked trapezoidal stone alternately and the regular pattern of the gap performs the play of light and shadow. Massive and meticulous texture of the wall generates a cave-like space, which recalls the image of a primitive house. Interior of the living and dining room is finished with hard wood. 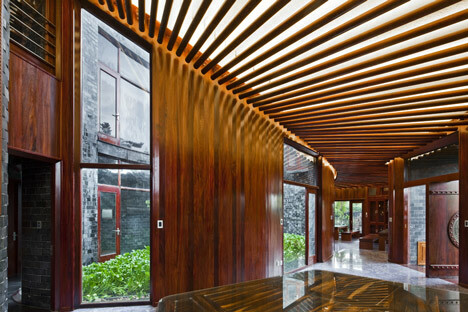 Wood boards on its wall and round-shaped wood louvers under the ceiling create a friendly atmosphere for gathering. Louvers have LED tapes on its tops of and provide indirect light to the space underneath. The fence of the house was also made of blue stones. It is harmonized with the main building and its garden. Creepers on the barb wires on the fence form a circle of green, and this green fence together with the green roof create a multi-layered green-scape and become a landmark of the town. Cow grass was originally planted on the roof and several native ferns covered the roof afterwards. The combination of plants, stones and timbers provides a space, in which the time of the family is being recorded. The family with 2 young children has been enjoying their living in the house which changing day by day. They sense each other and deepen their communication, rounding and rounding in the house.